The Ruby on Rails Tutorial book and screencast series teach you how to develop and deploy real, industrial-strength web applications with Ruby on Rails, the open-source web framework that powers top websites such as Twitter, Hulu, GitHub, and the Yellow Pages. The Ruby on Rails Tutorial book is available for free online and is available for purchase as an ebook (PDF, EPUB, and MOBI formats). 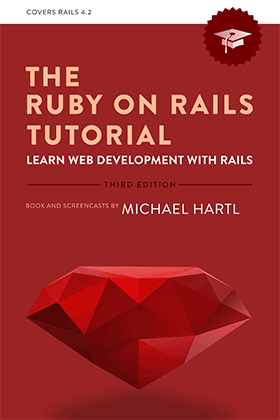 The companion screencast series includes 12 individual lessons, one for each chapter of the Ruby on Rails Tutorial book. All purchases also include a free copy of the Solutions Manual for Exercises, with solutions to every exercise in the book. Hardly a day goes by when I don't mention to someone how well the Rails Tutorial works. I am very impressed with the in-depth information that is provided, the quality of the presentation and how everything works exactly as described in the book. If you just carefully read and follow the instructions you can't go wrong. This is certainly the best tutorial i have used at all. I'm almost finishing the first time, and i gonna do more times to learn much more. I've observed that this is not a fixed tutorial, it has been updated constantly. That's the best Tuturial I have ever  read about Rail. Thank you Michael for your wonderful education. There is no tutorial more complete or easy to follow for a complete beginner. Highly recommended. I've gone through this tutorial twice, the first time making it to chapter 7 or so before I got sidetracked on other projects. Over the past month I went through the entire tutorial, and like a great book, my main, or only, disappointment was when it ended. From the first chapter it is clear that this is no "hello, world" tutorial. Instead of toy projects that are common in tutorials, from the beginning the emphasis is on real-world techniques and tools, such as using a version control system (Git), a cloud-based IDE (Cloud 9), unit and integration tests, and what is essentially a continuous integration test framework running locally, Guard. In fact, I think that by the end of chapter two or so, a new programmer has been exposed to some, or maybe most, of the best practices in the industry, not just specific to Rails. So this is not just an outstanding introduction to Rails, but a great introduction to software engineering. I've been writing Ruby code since 2001, and was at the Ruby conference in 2004 when DHH introduced Rails a few months after releasing the first version. So I've learned bits and pieces of Rails over the years, but Michael's tutorial filled in the gaps in my knowledge, including what has changed in Rails over the years. A recommendation: don't treat this as a cut-and-paste tutorial, just copying the code from the book into your IDE or editor. Take a little extra time to type all the code by hand (it really isn't much), and if you make a typo, all the better: I think I learned more thoroughly when I erroneously typed some code, and had to debug the app. After a while, in fact, I began to deliberately mistype or delete code to see what would break. I can't give this book a stronger recommendation. My hope is that Michael could write a sequel, a tutorial of the more advanced aspects of Rails and web programming in general. I learned Ruby on Rails at General Assembly's Web Development Immersive class in Santa Monica (you know where that is) and they recommended your book to solidify my skills and it certainly has! I got the videos and they were so easy to learn in combination with the book. I highly endorse the book as a must-have in anyone's educational library. Was a real joy working through the book. Good foundation, building on it is now surprisingly easy. Recommended. It walked me through the steps and gave me in-depth knowledge of ror and using command line. Can't wait to use it for my own project. If you want to learn Rails, get this. Hartl is the authority for Rails. Very clear and solid start to learning ROR. The video are a great addition to the book, and I recommend getting them. One of the best book to learn RoR. It provides a good balance between reading and coding. Best part is it's based on a real project. Screencasts are also awesome. I've worked my way through Michael Hartls excellent book twice now and I refer to it probably once a month. It's the best money I ever spent on a software book and I can't thank Michael enough for not just writing this book but keeping it updated, rails changes quite a bit between versions and the new versions are always on top of the relevant changes. Learn Command Line, I am dangerous now! I received a draft of the new series Learn Enough X to be dangerous, where X can be anything from Command line to HTML, etc. And I have to say, Michael did it again! Great new training man. And I have to say, RoR course makes it easy, at least easier if you have some computer background, the rest is all there for the taking. And now I feel more comfortable with Linux bash/terminal. I cannot wait to see what are the rest of the new courses in this Learn Enough Series. The company I work for banned the use of certain languages to be used going forward. They were pushing us to learn Ruby on Rails. We are a large company with many sites around the world. All of the developers were trying different methods to learn this language as quick as possible. Most of us started off on a learn rails site. Then one developer sent out an email telling us all about this book. This tutorial for me really helped piece the puzzle together and get a good understanding of how it all worked together. I like the walk through method. It helps build an understanding of how and why writing it that way works. I am new to developing and the book was great at taking me step by step through the process and not assuming I already knew how to do something. We now have several sites up and several more converted over to Ruby. We use AWS so I was glad to see this in the book. We now let all of our new developers know of the ROR tutorial book, because it helped us all to get started. I am still working through all of the lessons in this book, but I have to say as a beginner this is an excellent resource to follow! The instructions and directions are clear and concise, and if you follow along, you will pick up the basic concepts of Rails. The book also explains the basic concepts of Git and you setup your web app with Heroku, which allows you to learn the basics of the practice of version control. Practice makes perfect though, be sure to work on your own projects with the lessons if you really want to retain and apply the information that you pick up! One thing to note though, is that it was written for Rails 3.0, so some of the gems that you will install throughout the book may run under different versions. Just something to note as you are progressing through the book. All in all, a great book for anyone that aspires to learn Ruby on Rails! I come from an embedded ANSI C programming background. I had to learn Ruby on Rails as quickly as possible for a graduate studies class at Carnegie Mellon. I had zero knowledge and experience of website development when I started the course. Michael explains very clearly and focuses on the most important and necessary concepts. I had a solid RoR foundation in no time. I highly recommend his book. Not only a great way to start learning about Rails, but also about version control, Ruby, the command line, Starwars, and Monty Python. Michael Hartl's style to teach is awesome. - He is very careful about details. - The available Github (updated) material is great resource. Great for Beginners Learning to Code! With so much material available it’s often hard to know where to start to learn this enormous subject of web development. I am in the process of learning how to code. I’ve purchased the electronic version from the rails tutorial site, which is identical to the print edition here. Michael Hartl does an excellent job laying out the foundational basics and then building up from there, which has helped me immensely! Thanks Michael for making my learning to code journey easier!